Classes for every age/skill level ages 4 and up. The rest of the park will be closed for open riding this weekend while we are racing. WE OFFER 4 TRACKS FOR DIRTBIKES: Peewee, Intermediate, SX Style Night Track, Adv. AMA Race Track & Miles of Woods Trails for dirtbikes!!! We also have a new Endurocross course for the XC enthusiasts to check out and train on!! RV Hookups, Primitive Camping, Acres of parking and several tracks + trails for EVERY skill level! 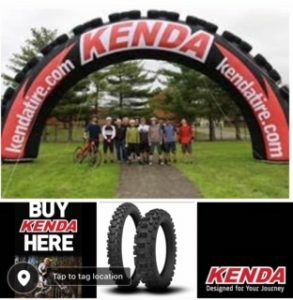 KENDA TIRES – The Official Tire of NCMP!! The North Carolina Motorsports Park is proud to announce that KENDA TIRES is on board as the official tire again for 2019!!!! Kenda Tires has been a leader in the industry and major supporter of off road motorsports for many years. We, at NCMP are thankful for their support and give back 100% of it to the riders and families. NCMP has over 180 acres of rolling wooded terrain which has been transformed into a motorsports park that has something for riders of all skill levels. OPEN NOW: WOODS TRAILS including a peewee beginner woods loop, kids peewee mx track, 3/4 mile Intermediate track, 1.75 mi advanced AMA Race track and NEW SX Track!!! North Carolina Motorsports Park is located in Henderson, North Carolina, just 45 minutes north of Raleigh / Durham and just 10 miles north of Louisburg. We are open 7 days a week from 10am to 5pm.